I was born in Tortosa (Spain), grew up in Barcelona and have enriched by the means of the world’s cultures. I consider myself a privileged spectator of the international contemporary performing arts and I’m engaged as an arts consultant, curator and analyst that culture reach the majority of people wherever in the world. As an independent consultant I also operate under the name of “Escena Internacional Bcn”. Design, organize and advice international cultural projects in the field of contemporary performing arts and cultural policies. I have 25 years experience in programming and organizing artistic and cultural events. I’m member of IETM (Informal European Theatre Meeting), organization of which I was part of the Executive Committee for eight years. I’ve been vice president of the “Asociación de Profesionales de la Gestión Cultural de Catalunya” and co-founder and vice president of the international network of performing arts platforms “EurAm Bourse”. 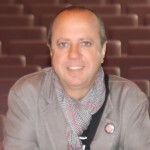 In the last years I’ve been content director of “Feria Internacional de Teatro y Danza de Huesca”, coordinator of “mov_s” (Space for International Exchange of Dance and Movement Arts), curator of the programme “International Theatres Management” of “Red de Teatros Públicos de España” and European Commission expert for the programmes “Culture” and “Europe for Citizens”. I make studies on international cultural policies and best practices in managing arts projects (most of the studies can be downloaded here). Among my recent studies: “Practices and Models of Support of Contemporary Arts Creativity in Europe”, “The Political and Legal Context of Private Support to the Culture in Canada and Quebec “, “The Arts Councils in Europe”, “The National Trust in England”, “Assessment of the dance sector in Catalonia” and “Strategic plan for the internationalization of Bask Country performing arts companies”. Previously I’ve been artistic director of the festival “Barcelona Street Arts” within the fiestas de La Mercè de Barcelona, artistic director of the Three Wise Kings Parade of Barcelona, project coordinator of NAUMON by la Fura dels Baus and, for eight years, member of the direction team of the Feria de Teatro de Tàrrega. I have also been, for eight years, actors’ teacher in the “Estudio Nancy Tuñón” de Barcelona. I was educated as industrial engineering and actor.